​​ ​SOUTH PADRE ISLAND – Cameron County Parks and Recreation officially broke ground on the Isla Blanca Park Amphitheater and Multipurpose Building in the Dolphin Cove area of the park. The $6.2 million project includes an amphitheater that will seat 4,000 and a 6,800-sf multipurpose building. Crews working at the construction site are expected to be finished by late summer 2018. The multipurpose building will be equipped with audio and video equipment, and will be able to seat up to 250 people. ​In addition, the amphitheater will provide an ideal view to watch SpaceX rocket launches that take place on Boca Chica Beach. 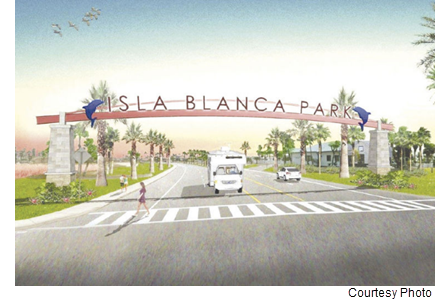 During the forthcoming phases of construction at Isla Blanca Park, the county will spend $17 million in gulf-side improvements and $13 million in RV site improvements. ​See previous story South Padre park adding $6.5 million project​.